Holds rear pallets back 4”-6” from pick face. Foot-operated release. Added safety for deeper lane, floor level, case-pick operations. Automatic pallet release engages when forklift removes front pallet. Separates front pallet until all cases are selected and empty pallet removed. Isolate last pallet for boost to lift table or mobile cart via pneumatic controls. Two separators strategically placed in deep-lane system for added safety. Effective, ergonomic way to manage empty pallets and increase productivity. Pallet Separators play a crucial role in gravity flow systems. Simply put, pallet flow lanes accommodate thousands of pounds of material with the intention of flowing down to a pick face unhindered. The pressure of the rear pallets, what we refer to as “back pressure” places a strain on the front pallet and possibly a safety hazard as the front pallet is removed. The Mallard Engineering Team has developed several unique pallet separator products to relieve back pressure in our gravity flow systems, increasing both safety and reliability. 3-deep system, 2,500 lb. load. Back pressure = .06 x 2,500 lbs. x 2 pallets = 300 lbs. 20-deep system, 2,500 lb. load. Back pressure = .06 x 2,500 lbs. x 19 pallets = 2,850 lbs. 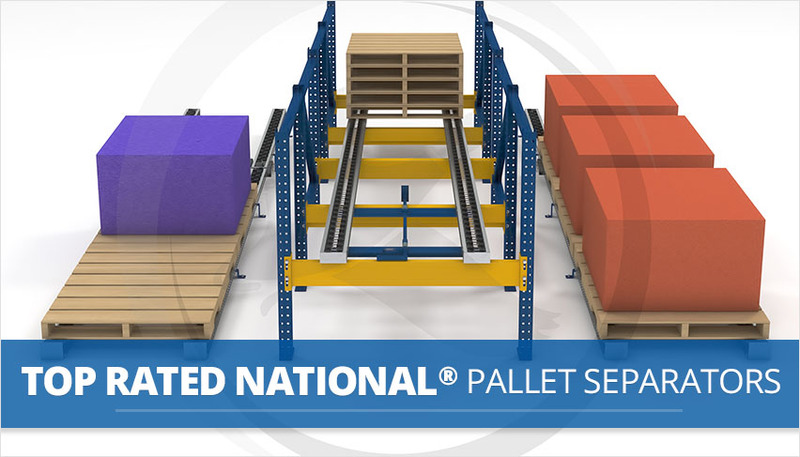 With a full line of pallet separator products, Mallard has you covered.